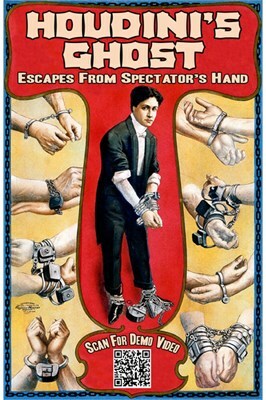 The magician displays a metal tube, explaining that it was the chain cover from the handcuffs Houdini wore while performing his famous Chinese Water Torture Cell escape--for the last time. Now his ghost is trapped inside the tube. Put a pair of ropes through the tube, and then tie the tube into a spectator's hand. With a pull, the tube escapes from the ropes!